Connecting with the world through music! Jeff Brucculeri is a very dynamic and versatile speaker and humorist. He can minister to a congregation in a Sunday service, motivate and challenge a youth group with his stories and unique brand of humor, or entertain a crowd at a banquet. Jeff is also a prolific master of ceremonies mixing his sense of humor with the ability to move a program along and keep folks entertained. With over 30 years experience as a radio and television broadcaster, Jeff's quick wit and his ability to relate to any audience, will endear him to your group or congregation. Jeff is a member of the Christian Comedy Association. Jeff is also a gifted musician and can minister in music with both voice and trumpet, in a full concert setting, or invite him to play a special number for the offertory or special occasion. If you believe Prov. 17:22, A cheerful heart is good medicine, but a crushed spirit dries up the bones (NIV), then Jeff has a healing ministry. 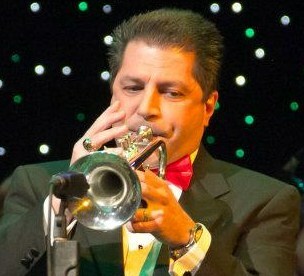 Jeff enjoys speaking and playing his trumpet, and making people laugh. In turn, congregations leave the service feeling happy and full of smiles!